Arsenic Pollution summarizes the most current research on the distribution and causes of arsenic pollution, its impact on health and agriculture, and solutions by way of water supply, treatment, and water resource management. Peter Ravenscroft is a Research Associate at the University of Cambridge and a hydrogeologist with extensive international experience in Asia, Africa, the Caribbean and Europe. He spent more than 10 years working in Bangladesh, where his involvement in research into the extent and causes of arsenic pollution in that country became the basis for this book. He co-authored the first book on groundwater resources in Bangladesh. Hugh Brammer spent 22 years with FAO in East Pakistan/Bangladesh, first as a soil surveyor then as an agricultural development adviser. Following retirement, he was a visiting consultant for a further seven years, inter alia for the Bangladesh Flood Action Plan, and wrote seven books on Bangladesh's physical environment and agriculture. Keith Richards is a fluvial geomorphologist and Professor of Geography at the University of Cambridge. He has research interests and experience in catchment and river processes and their management in Europe, Central America, India, Africa and China, and has been Director of the Scott Polar Research Institute and a Vice President (Research) of the RGS-IBG. He has authored and edited several books, and published over 150 academic papers. 1.2. The Nature of Arsenic Pollution. 1.3. History of Natural Arsenic Contamination. 1.5. Risk, Perception and Social Impacts. 1.7. Structure and Scope of the Book. 2.2. The Chemistry of Normal and Arsenic-Rich Groundwaters. 2.3. Adsorption and Desorption of Arsenic. 2.4. The Role of Sulphur in Strongly Reducing Groundwater. 2.5. Arsenic and Microbial Activity. 2.7. Associations of Arsenic with other Trace Elements. 2.8. Arsenic Pollution and Mining. Annexe 2.1. Analysis of Arsenic in Natural Waters. 3. The Hydrogeology of Arsenic. 3.2. Arsenic in Rocks and Sediments. 3.3. Arsenic in River Water and Sediment. 3.4. Geo-environmental Associations of Arsenic in Groundwater. 3.5. Geochemical Processes in their Geological Context. 3.6. Behaviour of Arsenic in Aquifers. 3.7. Case Histories of Arsenic-affected Aquifers. 3.8. Implications of Long-term Pumping of Arsenic Contaminated Groundwater. 4.3. Irrigation with Arsenic-contaminated Water. 4.4. Arsenic Uptake by plants. 4.5. Options for Arsenic Management. 4.6. Research and Development Needs. 5. Health Effects of Arsenic in Drinking Water and Food. 5.2. A Short History of the Health Effects of Chronic Arsenic Poisoning. 5.3. Toxicity of Arsenic Compounds. 5.4. Environmental Exposure to Arsenic. 5.9. Social and Psychological Effects. 5.10. Effect of Other Toxic and Trace Elements. 5.11. Geographical differences in Health Effects. 5.12. Case History of Arsenic Exposure in Murshidabad District, West Bengal. 5.13. Diagnosis and Treatment of Arsenicosis. 5.14. Removing Exposure to Arsenic. 6.2. Approaches to Water-supply Mitigation. 6.3. Surveys of Arsenic Affected Areas. 6.4. Exploiting Safe Groundwater Sources. 6.5. Developing Surface Water Sources. 6.6. Arsenic in Water Distribution Networks. 6.7. Socio-economic Aspects of Mitigation. 6.8. Policy and Planning Initiatives. 6.9. Monitoring and Evaluation of Water-supply Mitigation Programmes. Annexe 6.1. Arsenic Survey Procedures. 7. Removing Arsenic from Drinking Water. 7.3. Methods of Arsenic Removal. 7.5. Disposing of Waste from Treatment Processes. 7.6. Examples and Operational Experience of Arsenic Removal Technologies. 7.7. Costs of Arsenic Removal. 7.8. Guidance for Selecting Treatment Methods and Technologies. 7.9. Case Study of Water Treatment Requirements in Bangladesh. 8.6. Western, Central and Northern Asia. 8.7. Suspect Terrain and Research Needs. Annexe 8.1. The British Geological Survey Court Case. 9. Arsenic in North America and Europe. 9.2. United States of America and Canada. 9.5. Suspect Terrain and Research Needs. 10. Arsenic in South and Central America, Africa, Australia and Oceania. 10.2. South and Central America. 10.5. Arsenic in the Ocean Basins. 10.6. Suspect Terrain and Research Needs. 11. Synthesis, Conclusions and Recommendations. 11.1. Scale and Impact of Arsenic Pollution. 11.2. Chemistry, Cause and Prediction. 11.3. Agricultural Impacts, Prospects and Needs. 11.7. 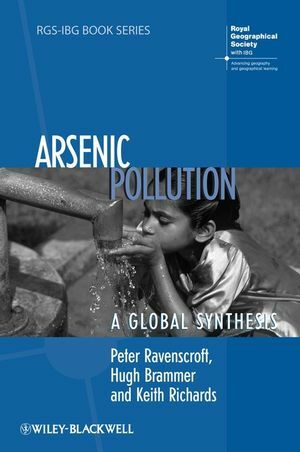 The Politics of Arsenic Pollution and Mitigation.